The Bayreuth researchers led by Prof. Dr. Stefan Schuster have now succeeded in making this screening redundant. The vector they used is a plasmid that contains a toxic gene. DNA fragments are then incorporated into the plasmid in such a way as to replace this very gene. If this does not succeed, the plasmid keeps its toxic potential. And if, in turn, this plasmid is taken up by an E. coli-bacterium, its toxic effect sets in: It interferes with the bacterium's cell division and therefore its ability to build colonies. In this way, it can be guaranteed right from the start that only those E. coli-bacteria that do, in fact, contain the DNA fragments will form colonies. They will not subsequently have to be painstakingly selected. "The reason why our new cloning system is so efficient is that the selection of the bacteria equipped with the cloned DNA occurs reliably and all by itself. The multiplied plasmids can then be isolated from these bacteria and used to analyse the function of the cloned DNA, or as the case may be, deployed in the biotechnological production of proteins," says Bayreuth biologist Dr. David Richter, lead author of the study. Moreover, the method presented in Scientific Reports simplifies the cloning procedure in one other aspect: The scientists also optimised an extract (SLiCE) derived from the cells of E. coli-bacteria to make it particularly suitable as a "glue" to string together several DNA fragments. 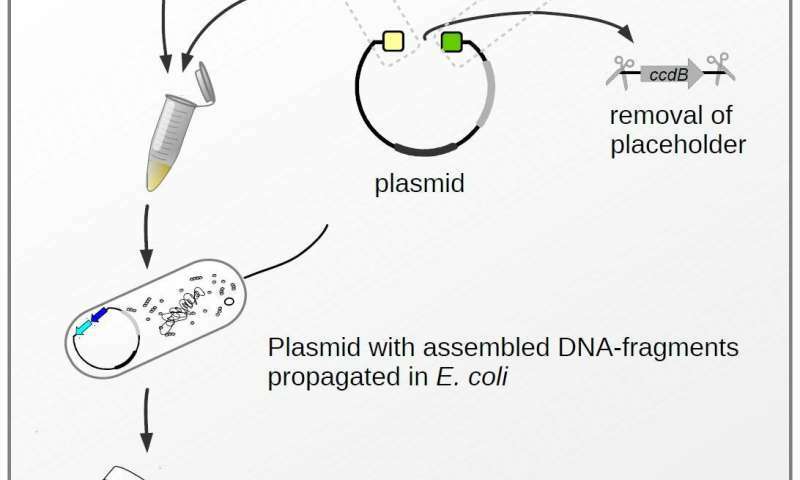 Consequently, it is now possible to insert all sorts of combinations of DNA fragments into the plasmid – and that much more quickly than with previous methods. The Bayreuth research team have named their new cloning system "ZeBRα"; the acronym deriving from the scientific terms for two decisive factors in their work. The plasmid used is a "Zero-Background Vector." This means: Bacteria which do not contain the DNA fragments to be duplicated do not form inconvenient colonies in the background. Meanwhile "Redα-Exonuclease" is a component of the E. coli extract, with which various DNA fragments can be strung together and incorporated into the vector.